After undergoing a long cold winter, an adonis comes into bloom at last to welcome the onset of spring on March 4, a day before gyeongchip, one of 24 solar terms in early spring. Gyeongchip is one of 24 solar terms which literally means awakening of animals and insects from their winter sleep. Fresh green sprouts can be spotted during this time in early spring. Adonis is one of the perennial flowers in part of the buttercup family. 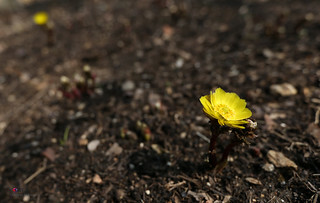 This plant often comes into bloom when snow still remains in early spring. Many festivals take place in Korea in March to welcome the coming of spring and enjoy spring flowers. Some well-known festivals include Gwangyang International Maehwa Festival, various sansuyu festivals located around the country, and Yangpyeong Strawberry Festival.